Check out the new Lamancha BUCKs!!!! Due to continued limitations physically due to health and finance, I no longer have nigerians, although if you need one I can refer you to people who have them. GCh.Dragonflye Farms HD National Hero "Nate"
A Handsome, dark red chammy buck with milky lines/ we are really excited to see what he will give us. Visit Lost Valley Nigerians when you are finished here and see alot of very nice goats with milk and conformation scores/titles.! 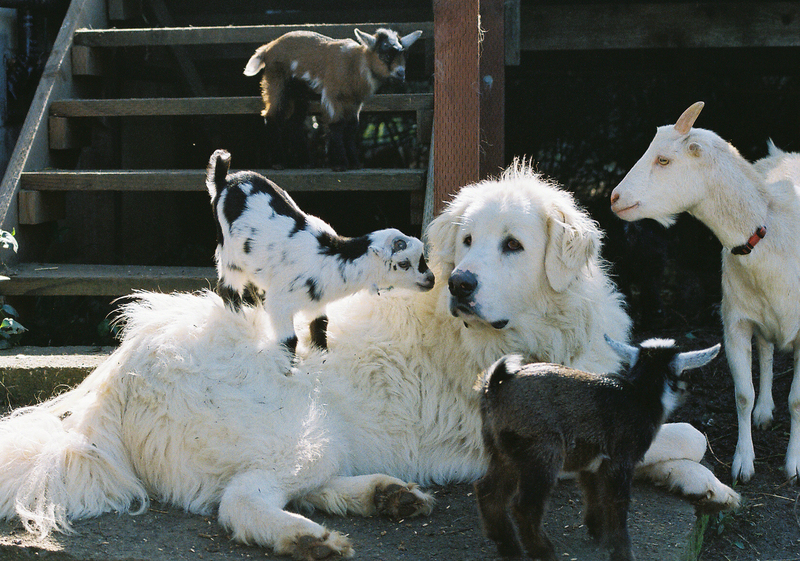 Piddlin Acres PM Timbura "Timmy"
Nikki and Ale's friend Barook,LGD (a Grt.Pyr X Akbash ) mingle with the new kids in the morning. Pictures and info on this website are copyrighted and permission to use anything must be given in writing by owner.. All rights reserved.2008-2010 Web Hosting by Yahoo!